At Beth Israel Deaconess Medical Center in Boston, doctor's orders can include an unlikely prescription: meditation. "I recommend five minutes, twice a day, and then gradually increase," said Aditi Nerurkar, a primary-care doctor and assistant medical director of the Cheng & Tsui Center for Integrative Care, which offers alternative medical treatment at the Harvard Medical School-affiliated hospital. "It's basically the same way I prescribe medicine. I don't start you on a high dose right away." She recommends that patients eventually work up to about 20 minutes of meditating, twice a day, for conditions including insomnia and irritable bowel syndrome. Integrative medicine programs including meditation are increasingly showing up at hospitals and clinics across the country. Research has found that meditation can lower blood pressure and help patients with chronic illness cope with pain and depression. In a study published last year, meditation sharply reduced the risk of heart attack or stroke among African-Americans with heart disease. At Beth Israel Deaconess, meditation and other mind-body therapies are slowly being worked into the primary-care setting. The program began offering services over the past six months and hopes eventually to have group meditation classes, said Dr. Nerurkar. Health experts say meditation shouldn't be used to replace traditional medical therapies, but rather to complement them. While it is clear that "when you breathe in a very slow, conscious way it temporarily lowers your blood pressure," such techniques shouldn't be used to substitute for medications to manage high blood pressure and other serious conditions, said Josephine Briggs, director of the National Center for Complementary and Alternative Medicine, part of the National Institutes of Health. In general, she said, meditation can be useful for symptom management, not to cure or treat disease. Dr. Briggs said the agency is funding a number of studies looking at meditation and breathing techniques and their effect on numerous conditions, including hot flashes that occur during menopause. If meditation is found to be beneficial, it could help women avoid using hormone treatments, which can have detrimental side effects. Martha O'Boyle, a 51-year-old in Fremont, Calif., has suffered from chronic pain in her arms, chest and elsewhere since suffering from a heart attack two years ago. "Here's a cardiologist telling me to go and meditate," said Ms. O'Boyle. "I'm thinking, does she think I'm crazy?" Ms. O'Boyle began taking meditation classes at Stanford Hospital & Clinics in 2011. The eight-week class consisted of once-a-week sessions lasting two to three hours. "Once I started the class I saw the benefits of it," she said. 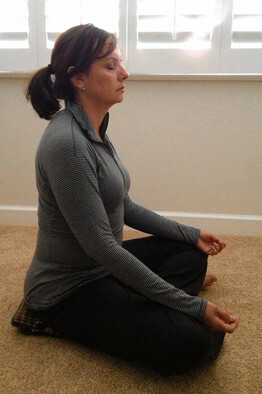 Now, Ms. O'Boyle meditates every day for 20 to 45 minutes. "The pain is not gone, but it helps me cope with it," she said. The most common type of meditation recommended by doctors and used in hospital programs is called Mindfulness-Based Stress Reduction, which was devised at the University of Massachusetts Medical School. Dr. Nerurkar said she doesn't send patients to a class for training. Instead, she and other physicians at Beth Israel Deaconess will demonstrate the technique in the office. "Really it's just sitting in a quiet posture that's comfortable, closing your eyes and watching your breath," she said. Murali Doraiswamy, a professor of psychiatry at Duke University Medical Center in Durham, N.C., says it isn't clearly understood how meditation works on the body. Some forms of meditation have been found to activate the parasympathetic nervous system, which stimulates the body's relaxation response, improves blood supply, slows down heart rate and breathing and increases digestive activity, he said. It also slows down the release of stress hormones, such as cortisol. Dr. Doraiswamy says he recommends meditation for people with depression, panic or anxiety disorders, ongoing stress, or for general health maintenance of brain alertness and cardiovascular health. Thousands of studies have been published that look at meditation, Dr. Doraiswamy said. Of these, about 500 have been clinical trials testing meditation for various ailments, but only about 40 trials have been long-term studies. It isn't known whether there is an optimal amount of time for meditating that is most effective. And, it hasn't been conclusively shown that the practice causes people to live longer or prevents them from getting certain chronic diseases. Some short-term studies have found meditation can improve cognitive abilities such as attention and memory, said Dr. Doraiswamy. Using imaging, scientists have shown that meditation can improve the functional performance of specific circuits in the brain and may reduce age-related shrinkage of several brain centers, particularly those that may be vulnerable in disorders such as Alzheimer's disease. In a study published last year in the American Heart Association journal Circulation: Cardiovascular Quality and Outcomes, African-Americans with heart disease who practiced Transcendental Meditation regularly were 48% less likely to have a heart attack or stroke, or to die, than those who attended a health-education class. Among the meditation group, there were 20 such occurrences, compared with 32 in the control group. The study, which ran for more than five years, involved about 200 people. Recent research found that meditation can result in molecular changes affecting the length of telomeres, a protective covering at the end of chromosomes that gets shorter as people age. The study involved 40 family caregivers of dementia patients. Half of the participants meditated briefly on a daily basis and the other half listened to relaxing music for 12 minutes a day. The eight-week study found that people who meditated showed a 43% improvement in telomerase activity, an enzyme that regulates telomere length, compared with a 3.7% gain in the group listening to music. The participants meditating also showed improved mental and cognitive functioning and lower levels of depression compared with the control group. The pilot study was published in January in the International Journal of Geriatric Psychiatry. Government-funded research also is exploring meditation's effect on dieting and depression.